At the beginning of 1964 young singer-songwriter Bob Dylan released what would be one of his most popular hits, “The Times They Are a-Changin’.” The song came out during a tumultuous time around the world and these changes were not limited to politics or culture, they extended even to the hammer throw which was undergoing a rapid transformation. At the front of the sport throughout this period was one man: Harold Connolly. 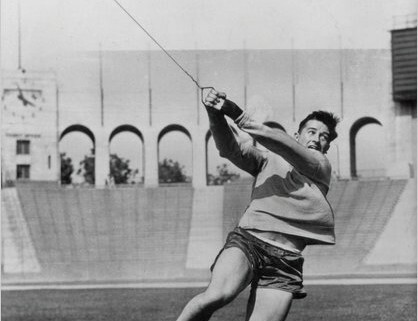 Connolly training at the LA Coliseum in 1956. Notice the dirt ring and absence of a cage. Connolly passed away three years ago today and I have made it an annual ritual to dedicate this day to writing about him, his unique character, and his contributions to our sport (see here, here, and here). Connolly first picked up the hammer in 1952. Four years later he was the Olympic Champion and set his first of seven world records. Those records held until 1965, although he continued to compete at a high level through the 1968 Olympics and nearly made the 1972 team. When he started out in the event it was not far removed from the days of throwing without a cage. The 1956 Olympics was the first to use a concrete circle, rather than the dirt or grass circles used before which sometimes required spiked footwear. The sector was 90º wide. Cages were considered an optional safety feature, and even when they came into regular use they were so flimsy and small that they did little to protect anyone but the officials. Technique was atrocious and even the best throwers were hesitant to try out new training methods like weight lifting. Most importantly, the event had stagnated: the world record had increased just two meters in the 40 years prior to 1952. Connolly did not make all of these changes. In fact he claimed to have significantly set back technical progress as his competitors analyzed and copied his poor technique, a technique which was surely different but mainly for reasons of physical limitations than from an attempt to gain any bio-mechanical advantage. But the fact that he was so good helped push the sport forward as everyone was looking for ways to beat him. The Cold War had spread into the sporting world in the 1950s and an arms race had begun. Connolly dealt the first blow by beating Soviet poster child and former world record holder Mikhail Krivonosov at the 1956 Olympics. This was just one of many humiliating defeats, like at the 1962 US-Soviet dual meet where Connolly set a new world record on international television and in front of the nearly 80,000 spectators in what continues to be listed as one of the best track meets of all time. The Soviets also had their wins during this era, but the Soviets were never ones to take any loss lightly; they were no longer just trying to beat the Americans, they were trying to beat Connolly. 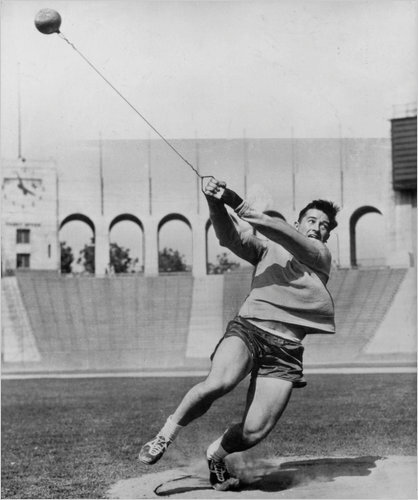 As the Soviets invested heavily in sport science and began to revolutionize hammer throw technique, Connolly was working hard to at least claim direct responsibly for one major advancement: footwear. After experimenting with modifications to his aunt’s old ballet shoes, he was able to get a local shoe repair shop to make prototypes of the first throwing shoe (New Balance later bought the design and began making a new type of distance flat). Dylan’s song has one prophetic line that applies to most revolutions: “For the loser now / Will be later to win.” As Connolly’s career was nearing an end the Soviets had finally created a champion whose legacy would last. In 1969 Anatoli Bondarchuk set his first world record and started on a career that would guide the event forward over the last few steps towards its current state. Bondarchuk went on to win gold in 1972, but more importantly the improvements in technique and training methods he implemented as a coach gave us our current world record holder Yuri Sedykh. But it may not have all begun without Connolly leading the way. His grit and determination led the drive to turn the hammer throw into what it is now: one of the most exciting events at last week’s World Championships. A wonderful tribute to a fine athlete. I was watching track meets in London in the 1950s and am not sure if I ever saw Connolly. I do remember a floodlit meet at the White City stadium in around 1956 involving US and other athletes and the organisers decided to spice up the hammer throw by turning off the lights and attaching fireworks to the hammer. Unfortunately the fireworks fell off in the first throw ( which I believe passed over the high jump pit without hitting anyone) and that experiment ended rapidly. At the 1958 Commonwealth Games in Cardiff the Hammer throw must have been set up improperly as the front rows of the stadium had to be cleared because the implement was close to encroaching on the spectators. Gosh. Without Coach Connolly, I would not be where I am today. He taught me alot about throwing the hammer. I have never willing worked so hard for anyone until I met him. He also taught me about life lessons also. I want to thank his family for sharing him too. Harold never waivered to give his time on a weekend or a weeknight to help an aspiring athlete. God Bless you, Coach Connolly.